I wanted to say thank you to all of you who expressed your sympathies during this difficult time. Naturally, I have been behind in getting around to blogs and probably won't be able to catch up (from looking at my feed reader)! It means so much to know that prayers are being said all over the world! The funeral was beautiful and it helps us to know that the community has embraced Alex's family in one LARGE hug! 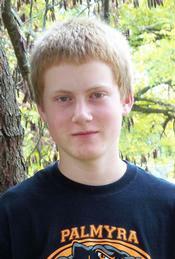 We have tragically lost our 15 year old nephew. He died at his home. Please pray for us. I helped my husband design this one! 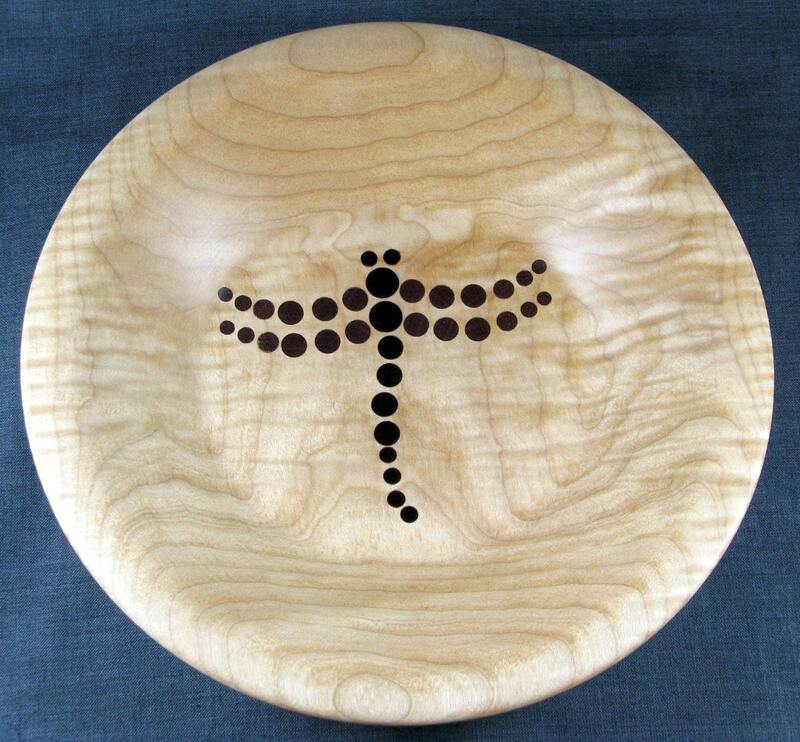 He turned each sized dowel separately and then inlaid them in the beautiful platter that he made on the lathe!!!! Shh. Don't tell. This is my Sweetheart's Valentine's card. 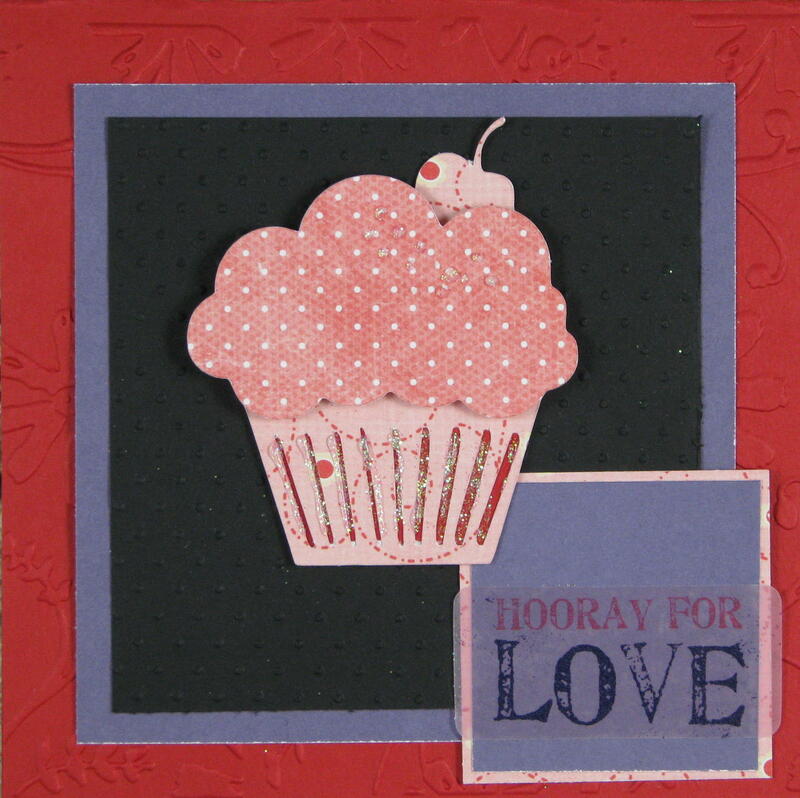 I made it for The Paper Variety's cupcake challenge using the sketch from Card Positioning Systems and the colors from The Color Throwdown! I thought they all went well together, and I was having a hard time deciding what to do for "You Know Who." Anyway, I used some embossing folders and my Cricut so this went together really quickly! Thanks so much for visiting my blog! If you leave a comment, I'll know you were here! I have been waiting for some great pictures to use this beautiful Bo Bunny paper!!! The blizzard we had last week gave me quite a few photos! This is Frenchie, our Blizzard snow(wo)man! She has sedum flowers for her hair!!! There is a story behind the leather mittens in the bottom left. The boys got new wallets for Christmas--so I saved the old ones to make mitten die cuts with my Sizzix. I embossed the blue mittens so they would feel special, too! 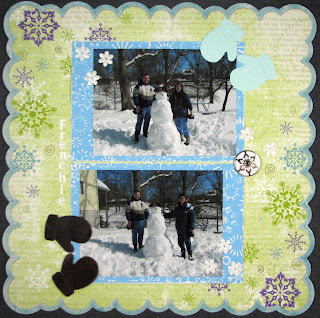 I also embossed the mats under the photos! The little white flowers sparkle in real life! 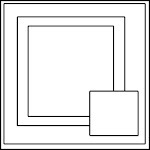 I am going to enter this into Simon Says Stamp Challenge - Anything but a card challenge. Thanks for visiting my blog! If you have time, please leave me a comment so I know that you visited! Have a great day! Look at this Darling Owl!!!! 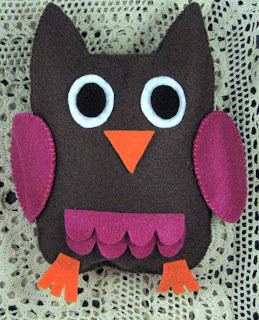 Katie from Tuscany Creative Etsy shop sent me this darling Mama Owl which I won on her giveaway over at One Happy Mama! You can buy a Mama and two babies in colors of your choice! 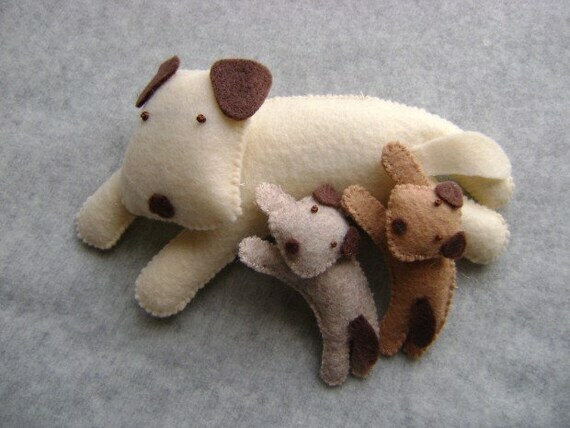 Katie makes the cutest little felt animals and other creations which she sells at her etsy shop!. She even has a little set of tools for little ones! If you need a gift and want something unique and hand-made, shop at Tuscany Creative! She just listed this darling set of puppies! 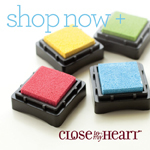 UPDATED to add this note from Katie: use code onehappymama to receive a 10% discount! DISCLOSURE: I was not asked to do this review and was not compensated for my opinion (which is my own)! I won the owl on a blog giveaway! I still have more photos from our Memphis Zoo trip over 2010 Spring Break! I made this using Sketch Inspiration's sketch #206 for the one-hour tulle challenge at Creating Keepsakes! I cut out the tulle using a Sizzix die and layered it with flowers and brads. I love how the flowers turned out! Thanks for visiting my blog! I hope you'll leave a comment! Have a great day! I still haven't finished scrapbooking all of our San Francisco 2009 trip! Steve was lucky enough to get to attend a work conference there, and it coincided with our 10 year anniversary! What a great place to celebrate!!! We ate a delicious "early bird" dinner at the Cliff House. It was divine! 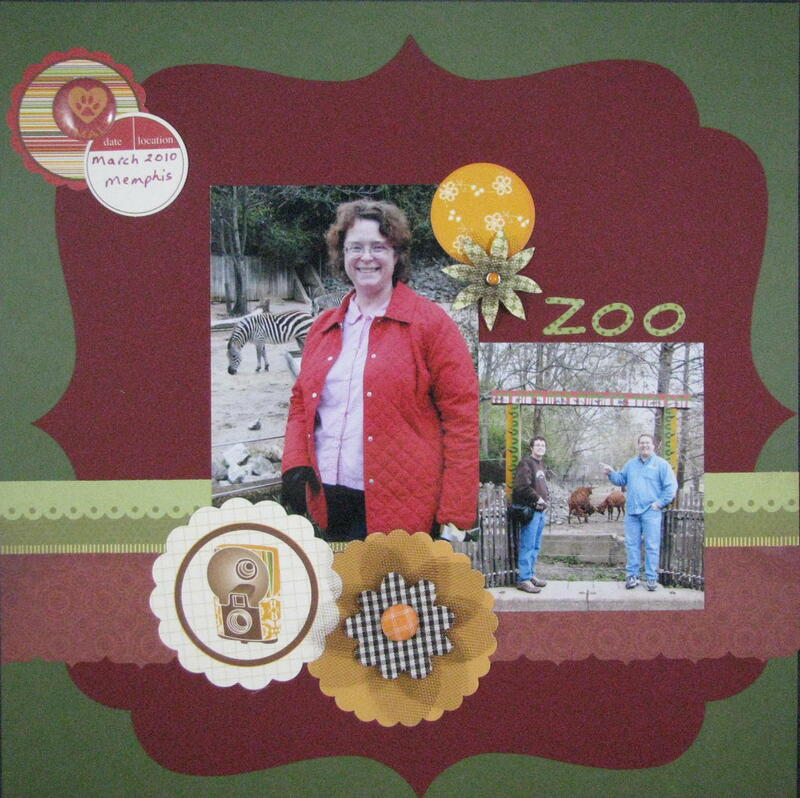 I used Sketchy Thursday's sketch to create this three-picture Harmonie layout! 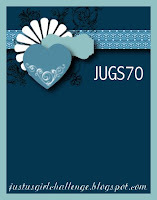 I just love this Canadian based scrapbook paper company! I did a little fussy cutting of the flowers! 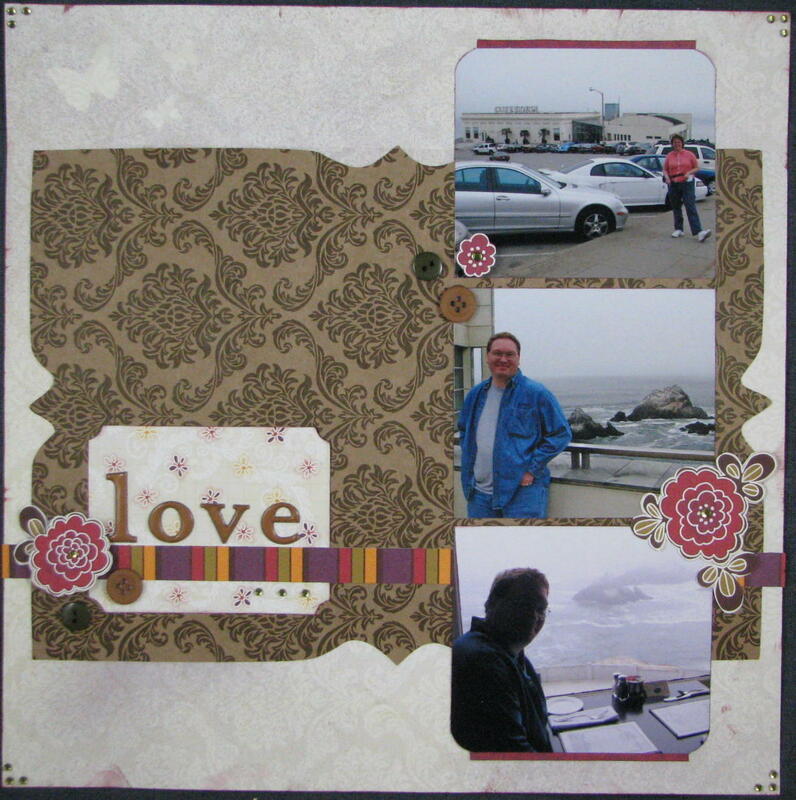 Can you see that I used some of my hand-made shimmer mist on this layout? 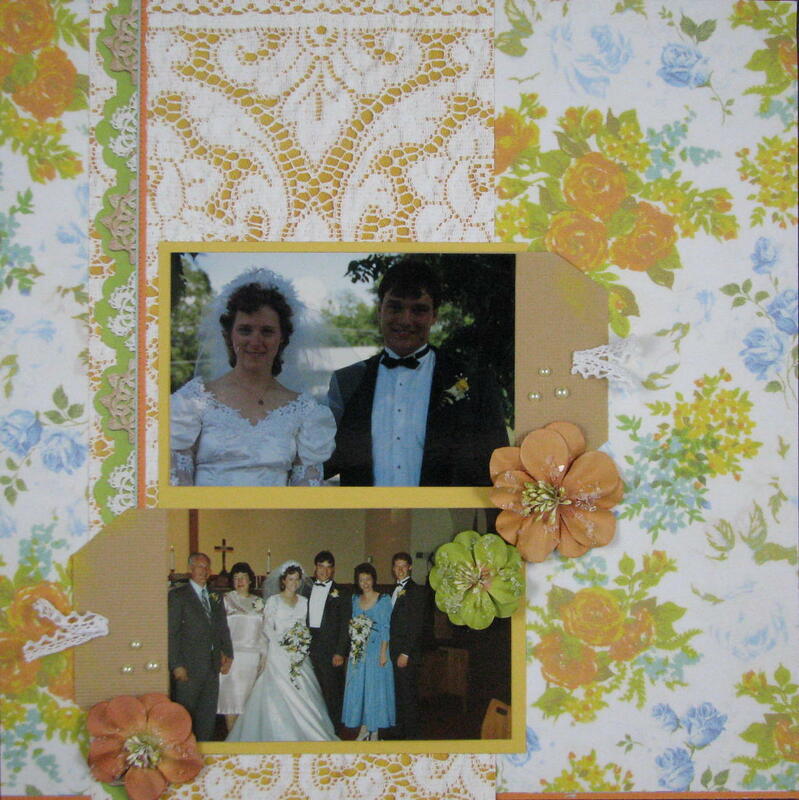 I used some Martha Stewart and Fiskars punched butterfly masks up in the left corner! I also added some jewels in the corners and in the centers of the flowers! 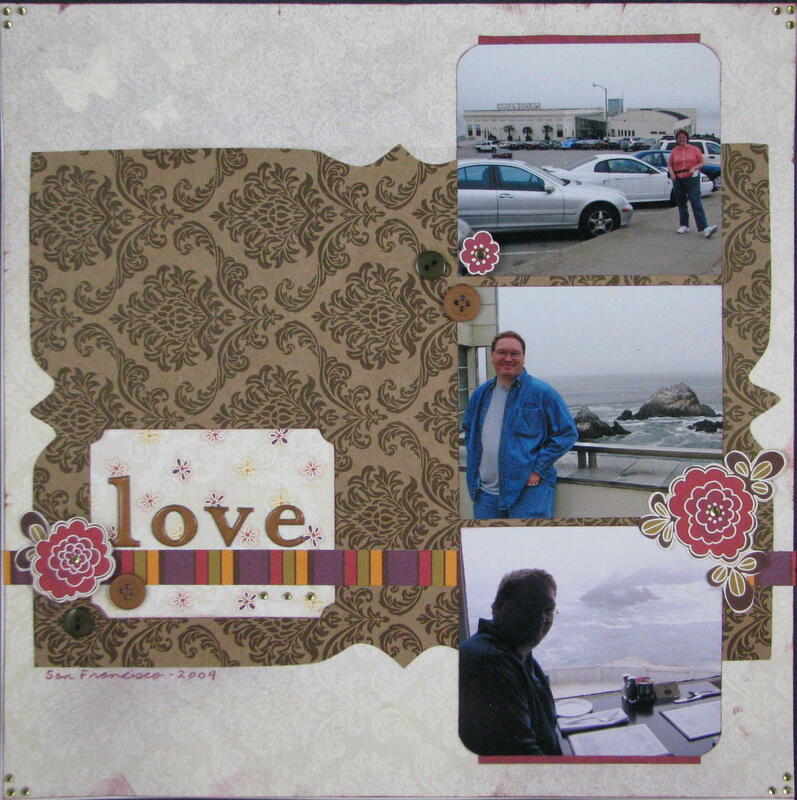 I also used some distress ink around the background and on the edges of the photos! We have such great memories of our San Francisco trip! I hope you enjoy looking at this! Thanks for visiting my blog! Have a great day! I made this layout for the Moxie Fab World Challenge: The Appearance of Cameos. Most people enter cards for these challenges, but I can't help but see what I can do on a layout! I still have so many photos left to scrapbook from our June, 2010 trip to Michigan this summer! We are buried under 18" (with mountains of snow piles in the yard)! So, the summery colors made me happy! 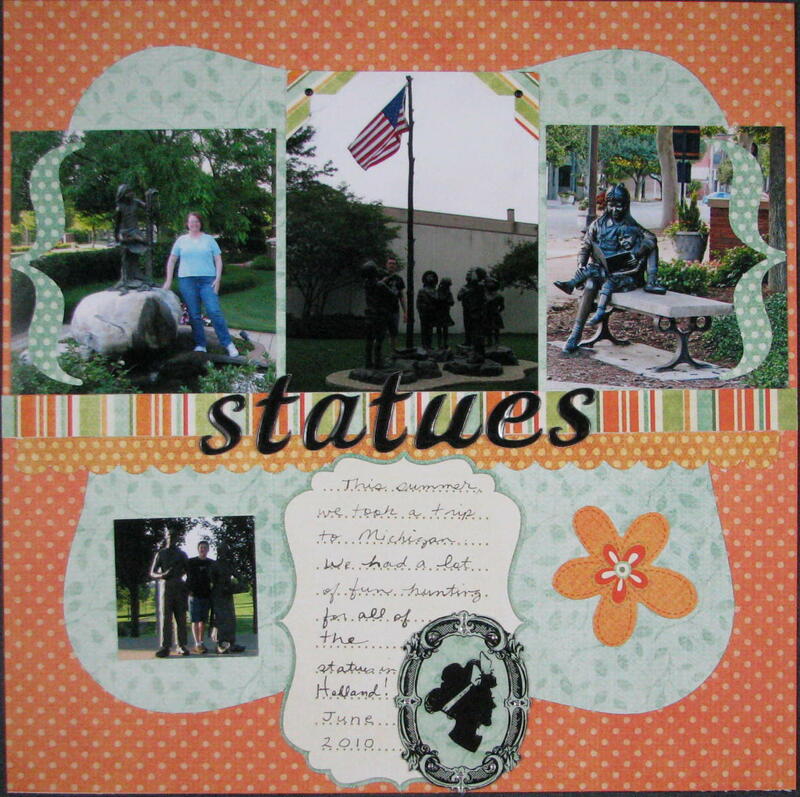 Of course, the silhouette cameo goes really well with all of the statues!! The cameo and frame are from Glitz Designs! The papers are from My Mind's Eye! And, of course, the letters are Thickers! This is Steve and me from ???? The date wasn't on the back of the photo, but I know it is at least several years old. This fits The Paper Variety's challenge this week. 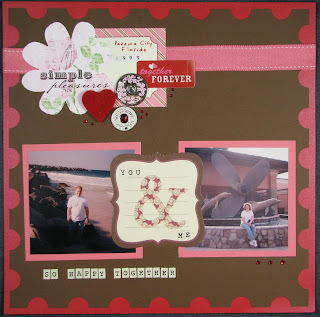 It also meets Really Reasonable Ribbon's Challenge #17 - Pink, Red, White theme and Simon Says Stamp's Love challenge. 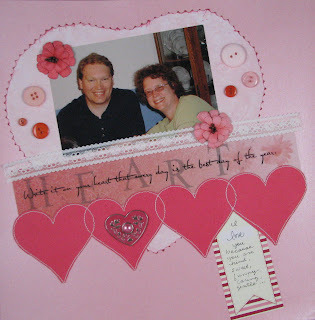 In the midst of our impending blizzard here in the Midwest, I have suddenly gotten the scrapbooking mojo going! Three layouts in a row! I made Monday, Tuesday, and Wednesday's layouts on Monday and thought I's spread them out over the week! I used Sweet Peach Crop Shop's beautiful January sweet kit that I won earlier this month and their January sketch to create this layout! I did add some Kaiser Pearls, a little lace from my stash and some Prima flowers (just because they matched the paper perfectly)! Sweet Peach Crop Shop's kits are a lot of fun! Here are the boys getting a "head start" on shoveling. We are only halfway through receiving all of the expected snow!! I have a Christmas cookie layout posted today, too! Please scroll down and take a look! I really like it! I hope you do to! Thanks so much for visiting my blog! I blog for and love comments! Please contact me before copying or sharing any images (including photos and layouts)! All content, unless otherwise specifically designated as belonging to someone else, belongs to Kelly Massman. All rights reserved. If you have a product you would like me to review, please contact me to work out details. Hi. I am a passionate scrapbooker from the Midwest. I am a former librarian and still LOVE books. I also adore travelling!